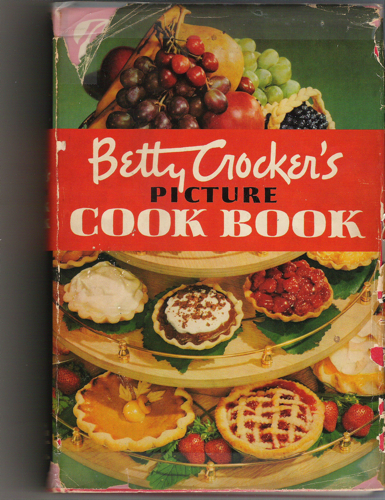 I have a wonderful 1950 copy of Betty Crocker’s Picture Cook Book. The first couple of pages show pictures of the company’s test kitchens. One is a red and white “polka dot” kitchen. It’s a dreamy place populated by an adorable, immaculately dressed and coiffed housewife. She is enjoying an ironing session against the cheerful backdrop of a yellow wall. “….Gayest, most colorful of all, with stainless steel counters and a laundry unit for experimental work with appliances”. How dreams have changed, don’t you think? We are crushed under a mountain of boring chores. We have so little time to do things with our own hands, to do things for ourselves, to just take the time it takes. Sometimes I rebel to the crush and I make some pasta. When I make pasta I take my time. It’s mine, totally. 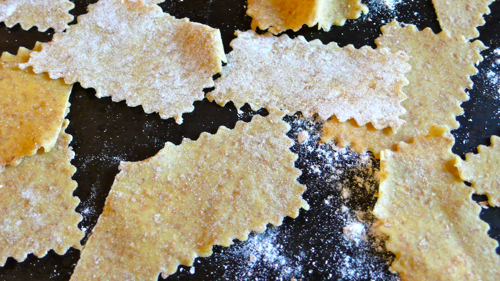 Maltagliati is a pasta shape which was originally made from scraps left over after making other pasta by hand. It’s particularly popular in Emilia Romagna where it’s served with beans. In my attempt to be a health-lover housewife I have made these maltagliati with 50% whole-wheat flour. Be sinful if you wish and use 100% white flour, it’s good for you anyway. Make the pasta dough in 3 minutes using my food processor recipe. Cover with a tea towel and let it rest at least 10 min. Whole-grain flours are more difficult to work with than white flours. They tend dry out and crumble and that’s why I add olive oil. If you are not an expert pasta-maker try first with white unbleached flour and use whole-grain next time. Roll the pasta into 25- 30 cm (10-12 inch) long sheets using a pasta machine. Please study carefully the method explained in the pasta dough recipe. Place the pasta sheets on a large wooden board or on cotton tea towels until dry but not brittle, 10-20 min. Using a pastry wheel cut the sheets into irregular 2.5 x 5 cm (1 x 2 inch) lozenges. The whole-grain version pairs well with some robust sauce like norcina, porcini or tuna. The white flour version is wonderful in a lemon sauce. You can also use it in my fabulous bean soup instead of taglierini. If using for soup, cook the pasta in water first and then serve with the soup. It will cook in one minute. Serves 2 with sauce and 4 with soup. I agree with your enjoyment of old American cookbooks, I have a couple dozen, the recipes I like most are the ones showing pork or beef roasts with an inch thick crust of crackling hot inviting fat, if not good for the heart at least it’s good for the soul. I so agree! and in my opinion, good quality fat, if eaten in moderation is not so bad. Processed food full of chemicals, even when low fat is much worse! what a wondeful image. I’d love to see a picture of yourself cooking with the vintage dress! How wonderful that you dress up in vintage dress while cooking!! I too have a kitchen scenario… Over the last 35 years during my many visits to Italy I’ve tape recorded hundreds of hours of local radio programs, street sounds (especially if there’s a church bell to be heard), electrical storms, family dinners, etc. Once the tapes starts rolling away I’m instantly transported back to Italy again cooking in my family’s 17th century kitchen, life seems slower and just more right as the tapes roll on. Dear Madonnadelpiatto, I must make the maltagliati with lemon sauce! Thank you ever so much for your column. My sisters & I have an old family recipe for a rustic pasta made from semolina, pecorino romano, parsley and egg that you roll out into large sheets, let dry and then break up in 1 to 2 inch pieces, then add them to a good old fashion Italian chicken soup. The recipe came from my grandmother from Napoli that we’ve only known as “treat” because that is what it always was, a treat! Nobody from our family can remember if there was any other name for it and we’ve been looking for it’s traditional Italian name on and off for quite a while. Also, if you ever make copies on cd of those beautiful taped sounds of Italy, I would be so interested in filling my little place with those sweet sounds of joy! thank you Gianni, it’s lovely to see you here again! how wonderful, thanks for visiting Sue Ellen!